FOR the first time in my life I heard the holy name of Swami Vivekananda from an advocate practising in the district court of Arrah, a remote town in Bihar. It was in a public library that he was speaking to some of his friends of the wonderful exploits of a Hindu Monk of India who hailed from a Bengali family of Calcutta and unfurled the banner of ancient Hindu philosophy in the Parliament of Religions at Chicago. It was sometime after, in the month of July 1898 that the sudden death of my elder brother caused me to move to the holy city of Varanasi, where my old widowed mother lived all alone and in bereavement. I had already been initiated by Swami Ram Swarupacharya, a disciple of Swami Bhagavatacharya and grand-disciple of Swami Rangacharya, the first abbot of the holy temple of Shri Ranganatha at Vrindaban and of Shri Dwarakadhish at Mathura. The Swami had accepted me as a Vaishnava Brahmacharin with all the formal rules of worship and strict discipline of brahmacharya. At this time The Life and Teachings of Shri Ramakrishna (by Suresh Chandra Dutt) had influenced me very much. Thus I was brought nearer to the source of the spring which was eventually destined to quench my thirst for a spiritual life as it had done to many others. It was the day of Mahashtami in the month of Asvina and I went to the Durga temple in Varanasi with Jagal Durlabh Ghosh, and it was with this friend of mine that I next went to pay my respects to His Holiness Swami Bhaskaranandaji, then residing in the garden house of the Maharaja of Amithi. There I saw two Sannyasins — Swami Niranjanananda and Swami Shuddhananda — with some other gentlemen who attracted my notice. The tall robust figure in ochre robes among them suddenly reminded me of Swami Vivekananda who, by this time, had returned to India. Maybe, he is the Swami, I thought, and waited for its corroboration. The tall Swami accosted Swami Bhaskaranandaji with the greetings of "Om Namo Narayanaya." as is the custom among the Sannyasins of this order and was returned "Namo Narayanaya" at once. They then talked intimately and with known familiarity. Somehow the topic of Swami Vivekananda came up, and at once the austere face of Swami Bhaskaranandaji wore a mild expression of love and reverence as he said,'Bhaiya, ek martaba Swamiji ka Darshan karao.' (Brother, bring Swami Vivekananda to me somehow so that I may see him once.) There were many others gathered around him who held him in high esteem as a great learned man who had attained knowledge; but he seemed to be indifferent about the impression he would create by such expression of admiration for Swami Vivekananda. The tall Swami replied, "I will surely write to him, sir; he is unwell and is now at Deoghar for a change." Swami Bhaskarananda said, 'Then please come again after the nightfall.' With this they parted and the person whom I was so keenly observing was also lost to my sight. 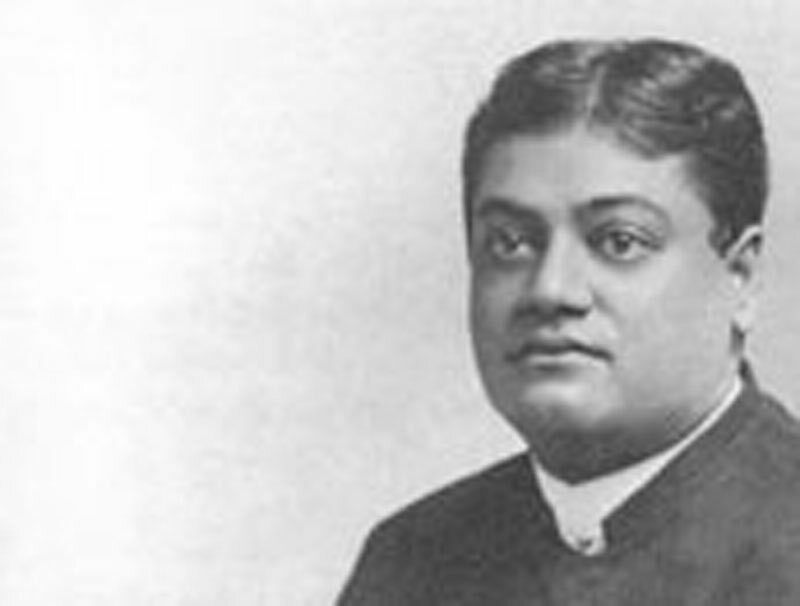 But on inquiry I came to know his name; he was Swami Niranjanananda, Swami Vivekananda's brother-disciple. One day in September 1898, as I was coming out after my daily routine of prayer and meditation. I met Charu Chandra Das, who later became Swami Shubhananda of the Ramakrishna Order of monks and was the founder of the Ramakrishna Mission Home of Service, Varanasi. It did not take long for us to become friends, and he lent me a few books published by the Mission, some of which were the works of Swami Vivekananda. A study circle was established in the house of my learned friend Kedarnath Mullick, later Swami Achalananda, and for about two years Charu Babu took great pains to convince us of the importance of karma-yoga and its bearing on life in enhancing spirituality. He also read to us other works of Swami Vivekananda which emphasized other aspects of yoga. We used to meet sometimes in the houses of Kedar Babu and Charu Babu and sometimes in our family residence as well. Thus he collected a batch of young workers to start a modest, very modest 'Home of Service'. Meanwhile, we learnt that the Swami Vivekananda was coming to Varanasi for a change and arrangements were made for his stay at the garden house of Raja Kali Krishna Thakur, who was well known to Swami Niranjanananda. The youths of our 'Home' had selected me to receive the Swami at the station with flowers and garlands. When the Swami alighted from the train on the platform. I put the garlands around his neck and the flowers at his feet. Then I looked up and saw full at his face and suddenly I remembered the face, already very familiar to me in my dreams. The details were so very alike, that I stood in silent admiration and wonder. He asked about me very mildly, "Who is this boy?" and questioned about me. Flowers scattered on the lotus feet of the Swami as they fell from my half-conscious folded hands, and I saw him turn his face to speak to others beside him; but again he fixed his loving gaze in deep tenderness on my entranced eyes, and he smiled. It look only a moment perhaps, but in that very instant, I heard him speak untold volumes of sermons which said. "Deny thy father, deny thy name, and for that which thou losest — take all myself; and my soul answered back, "I take thee at thy word". It is not poetry or fiction of days gone by, but simple truth as I experienced it. With the Swami came Mr. Okakura from Japan, whom we gave the nickname of Uncle Akrura, who wanted to take the Swami — our Krishna — to Mathura, i.e. Japan, and also Swami Nirbhayananda (Kanai), Swami Budhananda (Haripada), Gour, and Nadu (two boys). Swami Shivananda and Swami Niranjanananda were then at Varanasi, and all of them went to the "Sondhabas" of Raja Kali Krishna Thakur. The "Sondhabas" was five miles from the 'Home' where we lived, and daily we went to see the Swami there and occasionally spent the night there and dined together. Swami would then take any dish which tasted well and distribute it to us and then ask smilingly, "Do you relish it? Taste it, taste it. I give it to you for it tasted good to me." But it was not possible for us to be there every day, however much we desired it. One day, in my absence, Swami Shivananda requested the Swami to give us initiation, to which he consented, but fixed no date for it. Charu Babu and Haridas Chatterji asked me to confirm it from the Swami himself, and so I approached him with the request. Smilingly he said in a pleasant voice, "Why, you are already initiated as a Ramanuja Vaishnava. The worship of Vishnu is very good. I do not see any reason to re-initiate you." "But", I entreated, "I wish to be initiated by a yogi like yourself, to which he smiled his consent. Within a few days a brother of mine, a physician who was only next elder to me, died all of a sudden and I was shocked so much that it seemed that I had been shot point blank by a shell. A few days after, Swami asked me, "I hear that you have lost your brother. How did you feel about it? What did you say to your mother to console her?" On being told all that I had to say, he exclaimed. "Had it been one of my brothers, I would have no doubt fell it very very keenly." He was at that moment feeling the loss himself, and strangely enough, this sympathy removed all my pains altogether then and there. I felt he was my true friend and more than a brother, and I took a vow to surrender myself completely and irrevocably at his feet. Generally it is customary not to be initiated unless the sraddha ceremony is over, but Swamiji made an exception in my case and asked me to stay for a night for adhivasa, as the next day was fixed for initiation. In the morning we took our bath, prepared for the occasion and waited before his room. The doors opened even before our expectation, and Swamiji appeared there with a face illumined with divine fire and in peculiar accents asked us to come one by one, expressing it with a movement of his hand at the same time. Charu Babu pushed me to go first, and as soon as I went near him, he remarked, "Oh! you have come first! Well, well, come along with me, my boy. "Then we moved on to another small room, where there were two small carpets on the floor. He look his seat on one and I on the other. Within a few minutes, Swamiji entered into deep samadhi his body erect and stiff, all his limbs motionless, eyes half-closed and very bright; his face indicated divine emotion, power, and love. He was the very personification ananda; but his austere calmness had subdued all emotions which remained there frozen and fixed, without a ripple or wave. It was one person who had beckoned me inside the room, with the charm of love and smiles; it was now another personality that sat before me, who had transcended love or any other emotion. He sat thus motionless and time remained barred outside us. He seemed to fight against this manifestation and the emanation of divine Presence, and it was slowly subdued and remained controlled within his body. He took my hand in his, where it remained for a few moments. Then he spoke about a few of my past events of life and once remarked, "How did you feel when you were going to Chapra by steamer, when somebody spoke to you?" I had forgotten about that incident. but he asked me to try to remember it, if I could. It was Swami Ram Swarupacharya, whom I met at Arrah, and who later on gave me the Vaishnava mantra. He was a resident of Agamgarh district. He belonged to the Ramanuja School of Vishishtadvaita philosophy. I was asked to think of him, and as I did so, he said, "Now think of Shri Ramakrishna and transform me into him and then him into Ganesha. Ganesha is the ideal of sannyasa." At his touch all desires and thoughts evaporated from me and vanished. There was no attraction or repulsion; no desire or aspiration. I do not know how long I was in this state, but gradually I became conscious of my body and I could see the objects of the room etc. in a slight haze. I stood there initiated, and the Swami asked me to send the next aspirant. I went out and sent Charu Babu, who was initiated in the same way and next, Haridas Chatterji. After the ceremony was over, we dined together, and then I had to come away, for then work awaited me in the 'Home' or Sevashrama which had been started three years back, inspired by the ideal of seva as infused by Swami Vivekananda. Most of the workers had renounced their homes and lived on charity, which taxed their energies to the limit; but the work of the Sevashrama could not be allowed to suffer, and they did their utmost, which told upon their health very much. Swamiji was very much distressed at this. One day he called them all, and asked them to eat properly and take nourishing diet, for it was necessary to keep the body fit and strong to serve others. He used to say that the nature of work and the constitution of the worker must be taken into consideration, in the selection of food. Many of us were ascetics and would not even taste certain diets and delicious sweets etc. But the Swami stressed on the aim and purpose of seva first and last. For the service of others the body must be fit and healthy. Thus asceticism and personal samskaras were of less importance to the true worker and karma-yogi. He asked us to take our food with him, so that he could see us following him to the letter and spirit. Some of us now dined in our own families, but still he asked us repeatedly to dine with him, which we did whenever possible. Amongst us there was a young worker, very lean and thin, who attracted the Swami's notice. How kind he was to us can best be illustrated by the instance of this boy. This youth had come from some interior part of Bengal and was stranded in Varanasi. So he had joined the Sevashrama as a worker out of necessity, but he was very weak and sickly. One day he went to see the Swami who inquired about him and asked him to dine daily with him: "My lad, you are not very strong, and you have to work, you must eat well. You must come daily and dine with me: at least you must take your noon-day meal here with me." The work of the Sevashrama often kept the boy beyond the fixed time for Swamiji's dinner hour, who was constantly besought to take his food very timely, lest his fell disease, viz diabetes, aggravated. The physicians and brother-disciples entreated him to lake particular care of his health and he also agreed; but out of his motherly love for that boy, he forgot all their entreaties and his own health. Before dinner he would anxiously inquire about the boy and wait for him; he would pace the floor with impatient steps and look towards the road and the door expecting him to appear there any moment. If he met anyone, he would at once ask him, "Has he come? Poor boy! Why is he so late today? He is very weak and has not taken anything till now. So young and weak and so much to do!" When at last the boy came with hurried steps, Swamiji's face changed once again; it was glowing with the happiness and contentment of a mother who meets her son after a long separation. Smilingly he asked the youth, "Why, my child' why so late? I know you were very, very busy. But did you lake your breakfast in the morning? See, I have not taken my meal, for I am waiting for you. Come! my son, wash your hands and feet, let us hurry to our dinner. It is already late and you know, my boy, I am not so well. If I do not take my food timely it will aggravate my illness. So try to come a little earlier. But what could you do, my child, pressure of work has kept you so late; I know it, I know it." The Swami was followed by the boy and they took their seats with others. But while eating, he kept a constant watch on the boy and whatever he thought to be good or tasteful, was given to the boy from his own plate. Others noticed that the Swami was hardly eating anything, but with loving care was watching the boy taking his meal. Then they entreated now and then, "Swamiji, kindly take something yourself, you are not eating anything today." But who would listen to it? The Swami had forgotten his self, to him the boy was Gopala. One evening Swamiji sat on a cot and Swami Shivananda on the other. There were several other gentlemen in the room who were silently enjoying the jocosity and witticisms of the two. Swamiji was like a blooming cherub with a happy boyish face, aglow with merry laughter which sparkled through his eyes around the room in eddies and whirlpools. Swamiji said addressing Swami Shivananda. "What do you say, sir? Then in your opinion I am Shukracharya — the guru of the demons! Say, Mahapurush, is it not? Eh — eh — have I put it right?" And again he burst into laughter. He raised his pitch higher and higher, while making faces in so many ways, which made the air reel and resound, and we looked at this mood of mirth with awe and reverence. A nerve in Swamiji's eye was somehow injured and had affected his eye-sight. Hence the allegory of Shukracharya who had one eye! Moreover, the Swami preached in foreign countries and made alien disciples; therefore he made this comparison with the one-eyed guru of the demons. Swami Shivananda fomented his jolly mood by saying. "Yes, sir, it is undoubtedly true." It was an atmosphere of simple laughter and humorous merriment. The laughter became contagious and it permeated and steeped us in a state of bliss. Ordinarily we understand by religion an unclean body and dirty countenance, morose and melancholy appearance, lean and thin body and a winter-face that never smiles, — one who is aloof with high sounding phrases from the great scriptures. But the Swami stressed that the jovial and jocular side of one's nature was no less important. "Witticism is the sign of intelligence", he would often remark, and he proved his saying by demonstrating mirth and humour in his own actions. I was literally awed by this high mirth of the Swami, and as I went to touch his feet, he said with a splutter of laughter, "Ho! Ho' So it is you (a Vaishnava), well. let me see how you bow down like a true Ramanujite," On any other day he would have said, "Oh! no, no, my lad — no need of this." But today he was in a different mood altogether. Swami Shivananda interposed, "No, Swami, he has rheumatism, and his joints are stiff — it will be cruel to the boy to ask him to prostrate like that." To this Swamiji replied, "No, that is nothing. It will do him good and cure him. Come, my lad, you can prostrate yourself without reserve." I did so, as this was a cherished desire in me, which otherwise could have hardly been fulfilled for fear of his annoyance. In such an atmosphere came a Brahmacharin who announced that the Mahanta of the Kedarnath temple had come for a personal interview. Swamiji's face became instantly sober, and his figure majestic. The Mahanta was in another room; the Swami entered it with Swami Shivananda, and we followed them. "Namo Narayanaya" came from the respectful Mahanta of the Kedarnath temple who sang a devotional hymn in Sanskrit. While he spoke in the Southern dialect, a Sinhalese Sannyasin interpreted it in English, and the Swami replied fittingly. The Mahanta said, "Swamiji, you are Shiva incarnate. You have come for the salvation of mankind. Your wonderful power manifested in Europe and America is unique in the history of civilization. You have held the banner of the Orient high before the Western people and every Hindu and each sannyasin feels himself glorified. Your interpretation and teachings of the great truths of the Vedas and their universal application shown by you have made us — the sannyasins and all the Hindus in general — very grateful to you." The hoary-headed, eighty-year-old Mahanta, whose knowledge and spiritual enlightenment were as great as his years, went on thus. Swamiji was visibly moved with emotion and softly replied, "Maharaj, I have not been able to do much. The little work that has been done is all through the Grace of the Lord. It was His will and His manifestation; the greatness, if any, does not belong to me in the least. This body only has become His instrument and vehicle, that is all. You represent the wisdom of the ancient times in your saintly life. You are illumined with the great Knowledge. If such like you bless me and cherish a kind thought for me, such works and many more will not be difficult at all. Moreover, you are the high priest of Kedarnath. It is you who are the incarnation of Shiva. I am nothing but a frail human being." The Mahanta added, "When you were touring towards the North, leaving SetuBandha Rameswaram, a palanquin was sent for you, to be at your disposal with men and monks from our principal centre there, for receiving you with honour in the Math. But you were weary and tired, as an ocean of men had come to get your darshan and so you could not accept our invitation. Therefore, the saints and mahatmas of our Math were very sorry, and to mitigate it, they have wired me to receive you here in the temple and Math at Varanasi and to request you to accept alms, at least one day, in the temple, with all your following." This humble petition from the old and venerable Mahanta transformed Swamiji into a young boy, as it were, and he answered very meekly, "If you wished so, you had only to ask me or could have sent someone with your request, and I would have gladly accepted your invitation without your taking all this trouble yourself. Anyway I shall certainly go." Next morning al about ten or eleven. Swamiji, Swami Shivananda, and others went to the Math of the Mahanta of the Kedarnath temple. There was a Buddhist monk who hailed from Ceylon and was then living in the Math. He asked Swami Vivekananda, "Sir, do you think that all the religions of the world have produced siddhas (the perfected ones)?" To this, Swamiji not only replied in the affirmative but emphasized this with many illustrations. He added, "Even in the condemned Vamachara Tantra there have been great siddhas. But you know, our Guru Maharaj (Shri Ramakrishna) used to say that that path is a dirty one." It seemed that the Bhikshu was convinced of what Swamiji said. Then the Manama Maharaj feasted them all sumptuously. In the afternoon, the Mahanta took Swamiji to another room where there were portraits of his guru and his predecessors, whose names and traits he enumerated. Then he brought two pieces of ochre cloth and wrapped one around Swamiji's loins over his "gerua" and over his body. The Mahanta was in a very happy mood. and he remarked, "Today I have fed a true Dandi sannyasin (Vedantist)." Then at the request of the Mahanta. Swamiji and others went into the temple of Kedarnath. Out of respect to Swamiji, arati of Shri Kedarnath was performed, although it was not the usual hour for it. But Swamiji, as soon as he entered the outer chamber of the temple where Nandi (the Bull) stands facing the Ganga, opposite the Lingam, became entranced into samadhi and stood at the door, still and motionless, without any outer consciousness. He could not move even a step further and stood there as a statue. His socks were getting wet. but none advanced to remove them, as everyone there had also entered into an inner sphere where the outer world and its activities were automatically suspended. Shri Ramakrishna used to say, "Within Naren's body is Siva." Also he said that Swamiji was one of the Seven Seers who came down on earth at his behest. And we were privileged to see this inner personality manifested before us. Everyone there could see and did feel the divine presence. When we came out of the temple, Swamiji was still in a state of divine ecstasy. Slowly and softly we came out and Swami Shivananda made Swamiji sit in an open carriage with great care, lest he might slip and get injured. The carriage moved slowly, and gradually the Swami came to himself. When it passed before a "Chatra" (a place where sadhus are fed free), boyishly he cried out, "Not-cot-Chetti" in broken Tamil. A physician often came there to see Swamiji. The apothecary had strong leanings to a particular system of theology newly evolved in the country. He went on saying about its founder and how it was doing a great service lo the country and even affirmed that that was the only right and logical institution in India. Swamiji listened without any comment or contradiction which emboldened the physician to speak in this trend more dogmatically. Gradually Swamiji's face underwent a change and his features became hard and firm. Suddenly a torrent of words came out of his mouth. The voice was serious and resounding and almost dictatorial. A new personality now spoke to the doctor who listened in amazement: "The foreigners are (he teachers in every way of this country. Only religion remained; but you want to give them precedence even there. You have made Europe your guru and have become their hypnotized slaves. Do you think India has fallen so low that you must import even religious preachers? Is it a thing to be proud of, or should you be ashamed to own them? I have not come here to make orations and give lectures. I am ill and I want quiet and rest." Swamiji raised his voice and with bright pink large eyes fixed at his critic said, "If I so wish, this very night I can bring the founder of your pet sect and all Varanasi at my feet. but I do not want to use such divine power in this way unnecessarily and so I have not done it," A little while ago the doctor who did not place Swamiji spiritually above the ordinary level had remarked patronizingly, "So, sir, such and such has not come to you — it is a matter to be regretted no doubt." This had annoyed Swamiji a little. So came this correction. The physician changed his topic and Swamiji resumed his calmness in a moment. Again we saw the composed sannyasin radiating peace around him, as if the whole episode had never taken place at all. Mr. Kelkar, the well-known patriot, was in Varanasi at that time. One evening he came to meet the Swami who lay on a bed as he was quite ill. Mr. Kelkar entered the room with marked respect for the Swami, as one would do to one's own guru or a great saint, and took his seat on a carpet on the matted floor. The conversation went on in English. We sat at a distance and could not hear all that was said; but we saw Swamiji talking mildly, lying. Soon he warmed up, sat up on the cot, and began talking like a healthy person. Then he became more emotional and his eyes became large, lips contracted, quivering and hardened. The large forehead showed several creases as the brows contracted and the face flushed. The sweet melodious voice became more and more resounding and high pitched, and his dormant powers became thoroughly awakened. It was quite a new experience for Mr. Kelkar, who was not only amazed at this transfiguration, but sat as if hypnotized, as Swamiji waxed more and more eloquent. The topic was of India and her distress. Politics, social reforms, and many other things were discussed. "What is the good of India living in this degeneration and extreme poverty any longer?" He thundered, "Every moment she is suffering a hell; no food and no clothes; dishonour and distress is her only lot; she breathes — that is all the sign of life she has got. It is a veritable hellish fire in which she is being consumed slowly and certainly. Was it not far better that she was extinct from the face of the earth?" He went on in this strain, and we heard him with bated breath and wondered al the terrible anguish he was suffering for the cause of India, He was a real patriot, a real saint. Did he not say. "Him I call a mahatma, whose heart bleeds for the poor"? It was literally true in his case, for the pain he fell was so poignant, that it made him forget his self-poise and even his state of ill-health. He told Mr, Kelkar that mere politics and copying foreign countries in such movements would not bear fruit, nor would the heartless foreign politics of other countries would help us. Only a spontaneous development from inside, following the ancient traditions, could lift India. He stressed on the last point greatly and dilated on it at large to Mr. Kelkar. He also said that it was only religion through which all social reforms and other developments in India would be much easier than any other new trial and experiment. Politics or social reform divorced from religion would not benefit India lastingly and effectively. Mr. Kelkar seemed to be much impressed with what he heard and he folded his hands in token of respect and took leave. Swamiji was a very powerful personality. On the one hand he would attack with an his vigour and might any wrong and injustice and would pounce upon and try to root out the evil altogether; on the other, his heart was very tender and soft. Once he said, "Is it possible that your finger would get cut by the soft bubbles of fresh-drawn milk? I say, even this may be possible, but the heart of Shri Radha was even softer." One day he was walking along a road in Darjeeling, enjoying the beauty of the hills along with a few others, after his breakfast. All of a sudden he saw, in a mental vision, a Bhutia woman, with a heavy load on her back, slip, fall, and sustain some injury. Others accompanying him did not see the incident at all. The attendants were young and inexperienced and did not know his moods of his super-conscious state. Swamiji kept his eyes fixed on some distant object and could not move an inch further. His face became pale, and he cried in pain, "Oh! I feel great pain here, and I cannot walk any further," Someone asked. "Where do you feel the pain, Swamiji?" He pointed his side and said, "It is here; did you not see that woman fall?" The youth, who could not understand anything, thought it queer that the Swami should feel the pain at all, but none dared say anything. Time taught them the great significance of this episode, when they learnt that a great sympathetic relation exists between man and man, and with these God-men who feel and visualize the feelings of others at a distance. We had started a society in Varanasi with the help of Charu Babu and others, some three years before Swami Vivekananda came there. It was our aim to study the literature about Swamiji and Shri Ramakrishna, discourse and discuss on these studies and work with special emphasis on karma-yoga. A few young men amongst us assembled together to meditate, worship, and mould our lives with noble ideals, while serving the poor and the distressed. By and by many prominent men of Varanasi joined us and our work expanded. We had named this as 'Poor Men's Relief Association'. We struggled for two years and in the third, Swamiji's practical Vedanta inspired us to reorganize it and we named the Institution, "Daridra Narayana Seva Samiti". After one year of such service. Swamiji came to Varanasi and accepted us as his humble disciples. Swamiji transmitted his power to Charu Babu and asked him to devote his energies particularly for this kind of service. He told us many a time, "You should think that even a pice of the poor public is a drop of your blood. How can you relieve the poor with relief societies? Do not march in false colours. Name it Shri Ramakrishna Home of Service and give it to the Mission for its complete management." We did the same. Thus the Sevashrama was established. It is customary among many aged Hindus to retire to Varanasi with a vow not to leave the city till death. A small landlord of Bengal, named Pandit Shivananda, who was very learned in Sanskrit philosophy and had attained a high state in practical sadhana lived there with such a vow. He had a large heart and wide outlook. He was acquainted with us from the very beginning of his arrival at Varanasi and became a patron of our "Poor Men's Relief Association" from its inception. He often quoted from the scriptures in favour of Swamiji's preachings, and said, "I have taken a vow not to go out of holy Varanasi, and Swamiji lives in Calcutta. Will he not come here once at least?" Swamiji did come there in the beginning of 1902, and Panditji went to see him. The very first meeting made him elated with joy and happiness and Swamiji became a great friend of him. Often the subject of their talk would be Shri Ramakrishna and his wonderful spiritual life. While speaking about his spiritual moods Swamiji would unconsciously manifest them. Sometimes Panditji discussed various topics on shastras. The Swami would often turn to his favourite subjects — karma and service. He impressed his ideas hard upon this staunch Brahmin who represented a type of Pandits of Varanasi, who laid too much stress on orthodox Hinduism. Panditji had an address printed in Sanskrit from Calcutta; but he would always forget to take it with him. he went to see the Swami in the exuberance of emotion. One day he took it and was going to see him, when Charu Babu and myself also accompanied him. We asked him. "Panditji, what do you think of the Swami?" He at once replied. "He is a true yogi, and therefore I go to see him every day. I am fully convinced that the lectures and other preachings which have made him so renowned are but secondary to his soul-uplifting force. The divine shakti plays in him and very little of it is manifested. It is impossible to judge his greatness and power — he seems to be an ocean without bounds." On the way we saw Swamiji passing in another vehicle towards the palace of Bhinga Maharaj, accompanied by Swami Shivananda. Swami Govindananda, and another Swami. Both the vehicles stopped and Panditji presented the address, with a little nervous agitation, to the Swami, who at a glance at the contents understood the purport of it and said with marked humility. "Panditji Maharaj, what have you done! I am a very ordinary person; such high praise and eulogy are not for me. I have done nothing. It is the will of God alone and He can make an ordinary soul His instrument to carry out whatever He wills." After this Pandit Shivananda was found very often to speak about the Swami to prominent men of Sanskrit learning at Varanasi. Many orthodox Pandits, such as Mahamahopadhyaya Rakhaldas Nyayaratna, were in this way convinced of the divinity in the person of Swami Vivekananda. Panditji was drawn to the Swami as to a magnet, and they became close friends. As he would not leave Varanasi. Swamiji came there to bless him — that was his inner conviction. The Raja of Bhinga was a big landlord near Lucknow who knew very well English and Sanskrit, and had taken a vow to spend the rest of his life in Varanasi, and never would go out of the bounds, not only of the town but even outside his own garden house. His aim was to end his days in the Bhinga palace near the Durga temple of Varanasi. He was a sadhaka and lived like a sannyasin. When he learnt about Swamiji's arrival, he sent Swami Govindanandaji to him with presents of fruits, flowers, and sweets. Swami Shivananda was also present there. Swami Govindananda addressed both of them with "Namo Narayanaya" and said, "The Maharaja desires to see you. If you permit him, he will come here in spite of his sacred vow not to come out of the garden," Swamiji was perceptibly moved and said at once, "No, no, that will never be. It is wrong to ask to break his vow. I shall go there myself; the Raja need not come here." Next day or the day after he went with Swami Govindananda and Swami Shivananda to see the Raja in his garden. The Raja said, "You are a great soul — like Buddha and Shankara." The entire conversation was marked with this kind of high respect and devotion for the Swami, and he discussed the scriptures as well as karma. The Raja was an ardent worker in the earlier part of his life and he entreated the Swami to start some mission of service in Varanasi and promised to bear its expenses. Swamiji's health was not good; so he could not promise. He only said: "I am now going back to Belur Math, and I shall concentrate on work more when my health permits." After various other discussions, Swamiji and Swami Shivananda returned to the "Sondhabas". Next day the Raja of Bhinga sent a closed envelope containing a cheque for Rs.500/- and a letter through a courier as a mark of respect. Swamiji addressed Swami Shivananda who was near him. "Mahapurush, you please start a Math of Shri Thakur (Shri Ramakrishna) here with this money," Subsequently in July a garden was taken on rent and the Ramakrishna Advaita Ashrama was established there. One day Shri Kalidas Mitra, son of the late Pramada Das Mitra, came to see the Swami at about 5 p.m. His father was a friend of the Swami. The Swami was quite pleased to meet the son of his old friend. He took his seat on the carpet. Swami Shivananda, Charu Babu, myself, and others took our seats near him, and he listened intently to whatever fell from his lips. I was young and not more than twenty, and cannot remember everything that he uttered that day, but still the picture is fresh in my memory, though half a century has passed. The high and pure souls often answer the very questions that a person thinks in his mind, even before he utters a word. The Swami did the same that evening. Once in London, before he began his lecture, the Swami said, "Each of you may write any question on a slip of paper and keep it in your pocket. There is no need of passing them to me, and I shall answer each of them. "When they did so. the Swami turned to the right and said. "Your question is this." Then seeing that a gentleman on his left waited eagerly to hear him say about his question too, the Swami turned to the left and did the same and then went on giving the details of his house, its contents, inmates, and of what they were doing at that moment, and so on. The person in question, as well as everybody else were astounded at this miraculous vision and the Swami thus demonstrated on about the questions of six or eight men and their houses etc. One day, in England, Swami Saradananda, who was suffering from malaria for a long time and was much reduced and weak, sat at the Swami's feet feeling tike a child near him and in that calm and meek spirit of surrender to his brother-disciple — who to him was no other than Shri Ramakrishna in another body — asked for his blessings and the promise of knowledge and salvation in an inspiration of spiritual fervour. In a moment he was calm and at the will of the Swami he became healthy and strong. Swami Saradananda testified to this psychic power of Swami Vivekananda, never revealed to him before. There may be many others, a few yet living, who had the occasion of seeing this phase of the Swami which revealed his great powers, the siddhis that came to him but remained suppressed as he hated to demonstrate them. Kalidas Mitra was a great lover of fine arts and he had studied them profoundly. As soon as Kalidas Mitra seated himself in the room his thoughts and ideas vibrated in Swamiji's mind, and his normal expression of face, voice, and modes of movements changed altogether. He looked at him and went on speaking on fine arts, painting, and its allied branches, even dresses of different countries and their relation to nature and modes of expression. He spoke as if he were delivering a very learned and interesting lecture to an assembly of artists and painters. None could guess at that moment that he was anything else than a painter and artist himself and all his life he could have done anything else than its culture and practice. The colour harmony, the different combinations of colours and shades, grace, postures, and different angles and position of the eye, the waist, the bust, and the different poses and altitudes, etc. — these were his subjects. I was young and could not follow the subject in detail; but I had no doubt that it was a wonderful lecture on arts and painting and crafts in general. Then the Swami compared and contrasted the different schools of painting in different countries — Italy, France, China, Persia, Japan, and Buddhist and Mogul India. Once the Swami was invited to a famous theatrical hall in France. Its drop scenes were painted by a renowned painter. The paintings of this artist and this particular stage were then foremost among all the then paintings and theatres in Paris. Swamiji knew French and could follow the drama played before him. All of a sudden he noticed some part of the screen which revealed some technical mistakes which could have been improved. When the play was over, he called the Manager and with him came the artists who were eager to learn the impressions of this honoured and renowned guest. When he pointed out the technical defects in the scene, they were astonished, for the scene in question was supposed to be a masterpiece, and the defect could not be detected even by trained eyes. The artist owned it and was highly pleased lo learn the Swamiji's suggestion about the harmony of expressions in the figures, thinking that he knew as much of the technique of painting as of any other subject. We have heard of another incident. When in England. Swamiji went with Miss Müller and a few others to see Prof. Vann. Miss Muller had been a student of logic under the Professor, whose Logic of Chance was as famous as his deep knowledge in this subject. He had spent his life in studying logic and was considered an authority on the subject in Europe. Mr. Vann had heard of the Swami. But as the metaphysical problems did not interest him much, discussion turned round the subject of logic alone. When Swamiji spoke on logic, the Professor thought, that like himself, the Swami had spent his time only in the study of this subject, and remarked to himself, "A logician of India has come today to meet another of the West." To return to the art of painting, the root of the word "chitra" is chit (heart). Whatever manifests the chit before us is picture. As soon as the Swami turned inwards into the chidakasa, the space eternal, all the principles of an and its expression came to his vision. He would at once know all the intricacies of art, and all the pictures that he had ever seen would focus themselves in his mind. He would very often say, "If I see a thing, it goes down into the subconscious region of the mind and again comes out on the conscious plane when thus required." Also, "If I meditate on the brain of a Shankara, I become a Shankara; if I mediate on the brain of a Buddha, I become a Buddha. Even the thoughts and subjects that never occurred to me before would all come before me when I concentrate on a particular subject and I could visualize all of them, so that I go on speaking whatever I feel, forgetting myself. As all of you know I have no learning and am a simple man!" He demonstrated this in England while he lectured there. We all thought that day of this peculiarity of the Swami and wondered at this philosopher who would only talk of painting and art and the technique of colours. Another evening Kalidas Mitra came to see the Swami. With woollen sweater and hoses on, he was sitting with his back arched over a pillow on which his hands rested. The Swami was ailing, with evident suffering, and breathed with some difficulty. We were sitting very near him on the carpeted floor. Mr. Mitra came and touched his feet and the Swami said, "My health is now broken down and it troubles me very much". Mr. Mitra asked what the disease was to which he replied, "That I cannot say. I consulted some of the best physicians at Paris and also in America, but neither could they diagnose it nor effect any cure or relief." Then Mr. Mitra inquired, "Swamiji. we have heard that you are going lo Japan. Is it true?" He replied. "Mr. Okakura has been sent by the Government of Japan for this very purpose. Japan is a fine country. She has made industry an art and every home a centre of industry. I went to Japan on my way to America. They live in small cottages of bamboos, and every house has a fine flower-garden and a few fruit trees. As a race they are very progressive. Eventually if I go to Japan by the will ofShri Ramakrishna, you must-accompany me. The Japanese have acquired the Western culture (of science and industry). Formally they are Buddhists, but they are rather spiritually indifferent. If Indian thoughts and ideals penetrated into Japan, she would become more religious. With a little injection of Vedanta she will progress marvellously." Mr. Mitra asked, "What good will it bring to India?" Swamiji replied. "By the interchange of ideas and culture between the two nations both will be mutually helped and both will progress," He talked about the wonderful progress Japan has made, and then in the course of the talk he came to the extreme poverty of India. He forgot everything about the state of his health and physical ailments. He was sorry and pained at India's low status and economic distress. His face became livid and sorrowful. Occasionally he sang the devotional songs of Ramprasad. This turned him into a different person altogether. We also visualized the sentiments and emotions of India in those songs and our hearts ached for our country. Swamiji talked about the rapid progress of Japan and how she raised herself from a simple state, not marked for culture and civilization, into a country with self-reliance. He spoke of the French Revolution and Napoleon. From an ordinary soldier Napoleon raised himself to the pinnacle of glory through self-reliance and strong character. This topic again changed his countenance and bearing completely. He had become another person, as if he had gone to the time of Napoleon in France. He was full of vigour and vitality. His face became set with a purpose, the voice assumed a strong volume and pitch, eyes became large, and they shone with a glim of steel. He was so. much excited that sometimes he knelt on the pillow and again on the carpet and sometimes leapt up even in that sitting posture. Speaking of Napoleon, he himself had become like Napoleon. It was as if he himself were directing the fight of Jena and Austerlitz. "There goes the enemy — far away — they are flying — stop them — forward the eastern brigade — do not let a soul leave the field alive!..." "We have won the battle — we have conquered," he cried in joy and sometimes with one hand and sometimes with both the hands raised he expressed his joy at the imaginary conquest and sang the French battle songs of victory. Then the Swami recited from the Lalita Vistara, the famous vow of Buddha when he sat on the slab of stone before his illumination, and he invoked that spirit in himself: "Let the body he dried up here on this seat, the flesh and bones be destroyed: but without that knowledge difficult to attain even in many cycles, I shall not leave this seat." There was in the heart of the Swami a great love for the brother-disciples and the householders devoted to him. If anyone were ill or he heard some bad news, he would be extremely anxious for that person. Until he heard that he was a little better, he would be restless. Many such incidents have already come out, and they need not be repealed here. Swamiji's health broke down completely and he used to say to Swami Shivananda, "This is a shattered body. How long can you keep it going? And supposing this body is no more, Nivedita, Shasi (Swami Ramakrishnananda). and others will obey me. They will die in harness and can never falter in carrying out my words. They are my only hope." In this way he would give us also hope and benedictions. His love and attracting power had increased so much during these days that his body seemed to us to be solidified emotions. Love, and sympathy, and from his lips constantly flowed a stream of love and blessings. When we used to go to the Swami, we did not understand what was knowledge and devotion" or the distinction between meditation and work. We were young and inexperienced. But we could understand his love — it was not of this world. We were attracted by his great love. Whoever has seen the Swami even once can testify that he has seen a man who could love and who came to teach love to the world. How many youths have renounced everything to join the order of monks only because of this divine love of the Swami! Even to this day this love compels them to sacrifice their own lives to serve others.